Spring has arrived and we’re in the mood for fresh and light salads to start the season. Pears are widely available and bring a crisp freshness to springtime recipes. 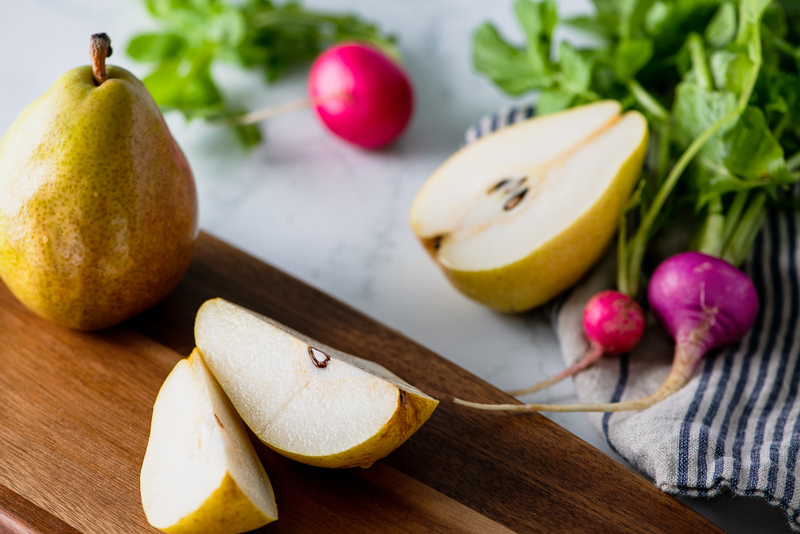 Our Asian-inspired pear salad features firm-but-ripe Anjou pears that hold their shape when spiralized. If you don’t have a spiralizer, just chop the ingredients into matchsticks or shave them with a mandolin or vegetable peeler instead. Having said that, you may want to purchase one as spiralizers are inexpensive and lots of fun to use, especially with kids! Start by making the dressing. Combine the rice wine vinegar, lime juice, soy sauce, sugar, ginger, and garlic in a bowl and whisk until fully combined and sugar is dissolved. Add the sesame oil, olive oil, sesame seeds, and chili sauce (if using). whisk again until well combined. Set aside. Next, prepare the salad. Fill a large bowl with cold water and the juice from half a lemon. Set aside. Spiralize the pears and place the spirals in the lemon water. Repeat with the cucumber, then the jicama. 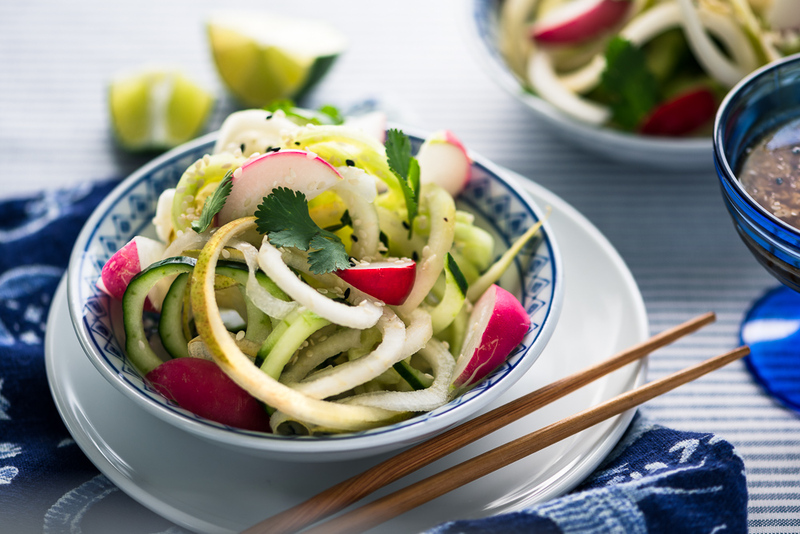 If you don’t have a spiralizer, just cut them into matchsticks or shave them thinly using a mandolin or vegetable peeler. Use a slotted spoon to remove the vegetable and fruit spirals from the lemon water. Empty the bowl and dry it. Put the vegetable and fruit spirals back in the bowl along with the radishes. Add half of the dressing and the cilantro and toss gently to combine.